Friends, today I file the necessary papers to become candidate for president of the United States. Many of you have been encouraging me with your support and your contributions to join this race and I want to thank you. And along with my wife Jill and my children Beau, Hunter and Ashley, we really look forward to being out there on the campaign trail with you and getting a chance to meet you. You know this is an incredibly challenging time for our country, because in my view President Bush has dug America into a very deep hole. This administration's mishandling of the war in Iraq may be the greatest foreign policy disaster of our time. I've spent the last four years traveling back and forth to Iraq, meeting with our soldiers, our generals and our diplomats and trying my level best to convince the president to change course. But as we've seen over the past few years, this president refuses to listen, even as he's proven wrong time and time again. Above all else that's why I'm running for president of this great country. For the next president of the United States is going to have to be prepared to immediately step in and act without hesitation to end our involvement in Iraq without further destabilizing the Middle East and the rest of the world. Our safety is literally at stake. Our soldiers lives are at stake. Our energy supply from the region is now at risk and America's leadership among the world's nations is at stake. President Bush will leave the next president with absolutely no margin of error in dealing with some of the most critical challenges this country has faced in the past 50 years. The next president is going to need the broadest possible coalition of Americans working together to get it right. And this is no time for the divisive politics George Bush has practiced in America. We have to unite our states around a community of goals, a unifying vision; we have to restore America's place in the world. And we also have to focus on the hopes and needs and dreams of the American people here at home. The Bush Administration, because it worships profits over people, has forgotten that to keep America strong we need a growing, vibrant middle class. We need our citizens to feel secure, secure that their children will get the health care they need when they're ill. Secure that they'll have the retirement income they planned on. Secure that we're doing all we can to end global warming. Secure that their jobs and opportunities will not vanish, like so many have in recent years. The next century will be an American century, but it's going to require vision from our leaders and faith in our purpose. I'm running for president because I believe we can stem this tide by restoring respect for America's leadership throughout the world, and by changing our priorities here at home. Hundreds of billions of dollars are being squandered on unnecessary tax breaks for the very wealthiest of us, on wasteful tax breaks for all those oil companies and on a failed policy in Iraq. Just imagine, imagine if we could take these hundreds of billions of dollars and refocus those resources on health care, education, building opportunity for the middle class. Like you, for me, everything starts with family, but real family values. Being able to take care of your elderly parents, keeping your children safe at school, at home and in the street, providing them with real opportunity for a good and affordable education, and leaving them a world that is less dangerous and more generous than the one we found. Most of all, maybe, instilling in them a confidence and a faith in God and in themselves. Our next president has an unparalleled opportunity to do all these things and a lot more. It's within our power to literally change the world and re-energize this country. The world is ready, America is ready and I'm ready, but I need your help, I need your support to accomplish all this. I believe with every fiber in my being that we are up to the task; the American people are not afraid. 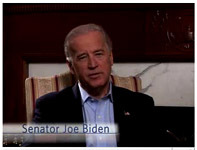 So please, please visit my website, joebiden.com, and add your name to the growing list of supporters we have. I want to thank you for listening, and may God bless America and protect our troops, particularly our men and women who are in Afghanistan and Iraq. Thank you very much. PRESS RELEASE from Joe Biden for President, Inc.
“I am heartened by the response so many people have given to my call for a new direction in American foreign policy and to our focus on middle class concerns,” said Sen. Biden. In the video statement, Biden stressed the disastrous results of the Bush Administration’s failed policies and handling of Iraq. Biden also emphasized the need for a change in direction more broadly in both foreign and domestic policies, stating, “To restore America’s place in the world, we also must focus on the hopes and needs of our own people. The Bush administration – because it worships profits over people – has forgotten that to make America strong, we need a growing, vibrant middle-class.